In terms of Culture & Heritage, Kells has it all. Kells is located in County Meath in the North of Ireland's Ancient East - just a stone through away from Newgrange, Hill of Tara and Trim Castle. Kells is famous for the "Book of Kells" which is now situated in Trinity College. The Abbey of Kells, with it's round tower, crosses and oratory can still be viewed in the churchyard of St. Columba's church. The Tower of Lloyd overlooks the town from the Hill of Lloyd is a spectacular viewing point for all. The Kells Municipal District extends way beyond Kells town and into areas with equally spectacular history - Loughcrew is just one example. 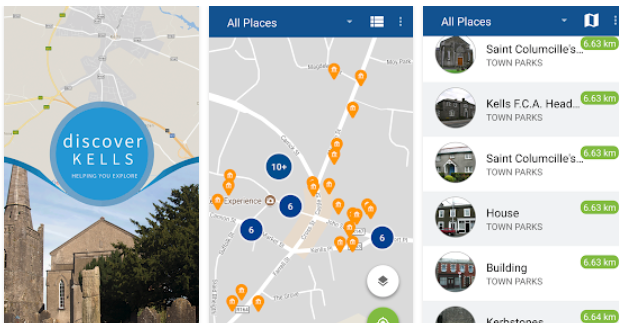 "Discover Kells" gives users all over the world the ability to travel and tour through the Kells Municipal District and discover the history behind it's historical features. Users can explore over 1269 National Monuments and buildings and features described by the National Monument Service and National Inventory of Architectural Heritage. Historical elements include everything from Megalithic tombs, water pumps, old telephone boxes, mills, churches, high crosses, wells, weirs to Sheela na Gigs - all spread across 248 townlands.